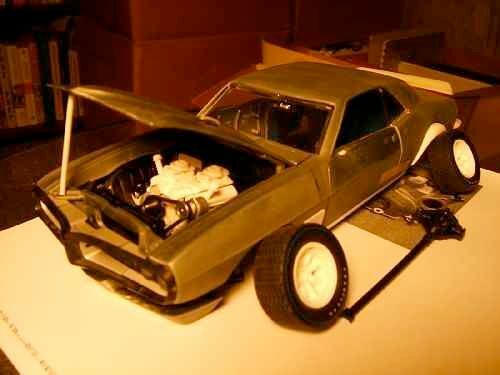 Re: Ideas to share concerning 1:18 '67-'69 GMP Penske Donohue Camaros. Ah, I hadn't thought of those recessed areas as being something needed for hinges. Typically they're a pretty simplistic affair and don't have real scissor action. on the front of the GMP models. Pretty silly, especially when they have bothered to install a rear one. I hope I can wrap matters up sooner, but noticing that the Autodynamics Challenger has/had consumed about a year sans rollcage and anything substantial to the chassis - this all less paint and finish work prompts me to reflect. I purchased a copy of model car magazine wherein a fellow scratchbuilt a 1:12 sprint car in brass, aluminum, and plastic resin. His project took five years, and this with complete research at his disposal (access to the car, blueprints in all likelihood, etc. ), a larger scale to work upon, far more experience with scratchbuilding methods, etc. Given that I'm learning as I go, haven't the store of techniques to draw upon, and move at a proverbial snails pace, perhaps the long view is the necessary one to take. The lifestyle equivalent of blunt force trauma in the form of MA/terminal Ph.D. academic study will cut into time that might be dedicated to the project(s) as well, and yet little updates confirm to myself that very involved projects can indeed be seen to completion, and this is something. Looking towards the chassis, work underway. Rear wheelarches removed, subframe rails resurfaced in anticipation of introducing Yat Ming arches as required by the need for clearance and ride height. Fuel cell housing added, this a cast GMP Camaro Trans Am item (the top half then) clayed up and cast without visible refueling detail - I may add mounting straps. Machine screw attachment points plugged with round plastic stock, semicircular for the reshaped front mounts reflecting clearance requirements of the new front valence, and simple solid plugs headed back across the chassis. Hwy. 61 identification sanded off each respective rocker panel, each now smooth. GMP Camaro Trans Am rear sway bar rests in position, although this may be redone from scratch. Front sway bar and associated mounts seen, but an early attempt and surely not thick enough. 'Stamped steel' valve covers (sans fins) cast and seen, as are dual Holley Dominators as run at Mid-Ohio, while a GMP cross ram with carbs. is also being prepared. It is my practice to mock up everything so that I might afford myself build options right to the end. The 10 bolt differential from the Lane Firebird is in position, and bears an extended sump welded to the back of the actual stamped diff. cover. Lastly, a plug is fitted beneath the front crossmember, with the standard sway bar removed in lieu of fashioning an upgrade. Thanks for inspecting this post. ...modest but necessary work then. 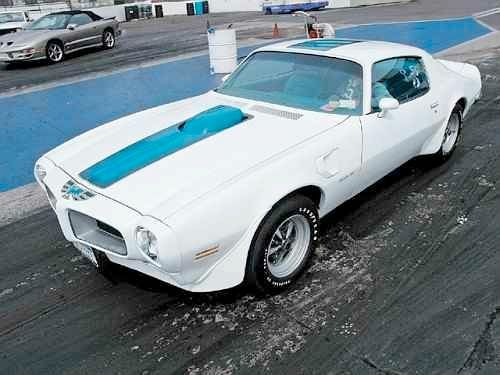 Mike, I will post more Firebird articles on the Titus cars as time allows. I suspect you may have them but others more likely do not and would get some useful insight by looking them over. Interesting that the rear frame is so poor and inaccurate on the Hwy 61 piece that you're having to go to the trouble to section in something from the Yat Ming version. It makes me want to go track one down to see how badly they botched the job. I see the Hwy 61 chassis uses the Turbo 400 automatic transmission crossmember. Are you able to source the correct crossmember from one of your other kits? I like that you are building enough extra parts and pieces to allow yourself some options right up to the end. I think that's a good idea. 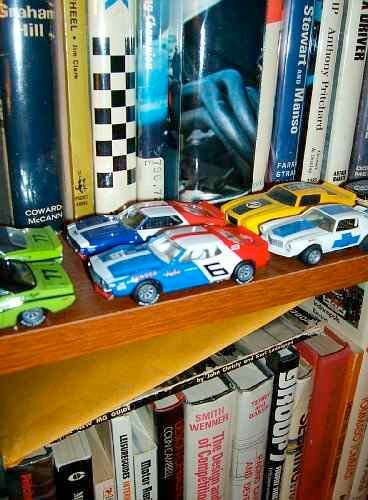 Somewhere, I've got a two-car scale model package of the '69 Mark Donohue Camaro and the '70 Parnelli Jones Mustang that may or may not be Hot Wheels. I forget, as I have not looked them over in quite awhile. 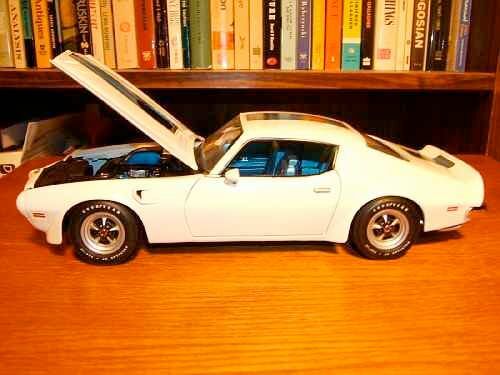 Looking at your 1/64 '71 Javelin on the shelf, my thought was that my two cars looked like they could be part of that line of cars as I do believe two other cars were available --- a Javelin and a Challenger. However, I never did purchase those two. Seen across both the Hwy. 61 Chrysler Corp. E-bodies as well as the first gen. Camaros they've thus far done, one notices that certain liberties are taken with the dimensions of chassis members to allow for a better scale appearance topside. Given that thick white metal/Zamac castings are used for the body, and relatively inexpensive plastics used for the chassis, etc., the dimensions of some aspects of these models (and others surely) are 'pushed around' given that nothing is thin stamping. My photo image disguised the problem of the entire trunk area topside detail design spec. effectively shoving the rear subframe rails forward into the bodyshell proper. I was aware that you were wanting to replicate the things inside the trunk but somehow it did not register how the topside of a particular chassis is not typically seen. Thus, it is poorly defined or just plain inaccurate. You've got your work cut out for you! I did find my 2-car Hot Wheels Trans-Am pack. Pony Wars was the name of the series, which I assume they no longer make. Revised front valence opening shape, with each dipping a bit lower toward the center of the panel. Initial engine mock up in place, consisting of a 1:18 GMP Camaro Trans Am longblock and all the cloned castings I could make in anticipation of using the same across other projects (i.e. ; I can now cast the center float Holley carburetors, the intake, the 'pressed steel' plain valve covers as before, etc.). 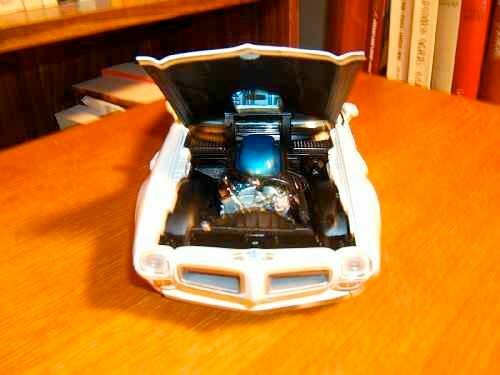 '67-'68 alternator placement seen, drive belt and accessory drive is from a 1:18 '67 Ertl Authentics Camaro, whereas alternator is a 1:18 GMP '69 Camaro item. GMP headers are in place, while the firewall, 1:18 Lane '68 Firebird hood/inner fender overlap and cowl proper have been adjusted for fit and now are nearly flush. Hood trimmed a bit up front adjusting for a bit of overlap atop bumper - note how it shines. Awful toy-like windshield and very thick A-pillars are prompting me to consider a thinning of the latter so that a replacement GMP front screen could be substituted. New cast '69 Minilites are seen, while two are out of sight and apart from the model. Al Bartz breather configuration about right, and now a bit shorter and cleaner for having worked on them since these photos were taken. Will fit distinct Bartz oil fill cap on a single bank as engine photo thread reveals ARA Camaro/Bartz-powered '69 entry so fitted - now I just have to make one. New intake being made, for homologation papers suggest that a Edelbrock SRT (designated a Street Tunnel Ram although appearing very much a cross ram) was employed (as does aforementioned ARA Camaro image) for the '69 season. Differences include a repositioned water/thermostat situated flat, a 'solid' plenum top lacking much detail but for bolts and bosses, and a repositioned oil fill tube/breather tube. Front subframe rail work to come involving the removal of the bland Hwy. 61 upper control arms, the fabrication of tops to said subframe rails, and eventual fabrication of the stiffening semi-space frame tubes off of the roll cage sprouting from the firewall heading forward. All feedback is hugely appreciated. Thanks and good will to the community. Mike, the car is looking like a more complete animal with the engine mounted in there like that. Really coming along nicely. It makes my head spin just hearing all of the various pieces which you are bringing together from the different kits, but I'm glad you are detailing which ones you are electing to use. I had not previously noticed how thick the A pillars were on this model and I think you're right that some slimming of those would go a long way toward improving the looks. I think some trimming needs to be done along the front of the radiator core support (upper leading edge) also, right? It generally looks pretty good up there except for that easily attended to detail. I see you have started work on the rear axle by removing the axle tubes. 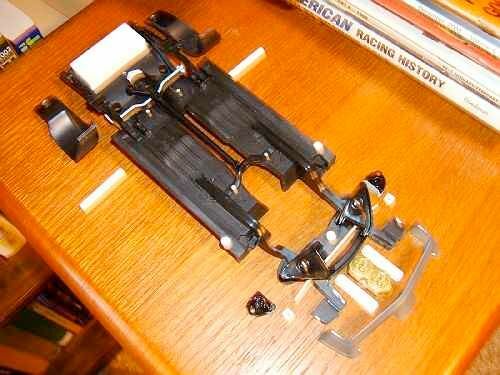 I'm looking forward to seeing that part of the car (rear suspension and axle) come together. It will be a challenge but there is no doubt you will be able to pull it off. Thanks for your update! Thanks for your very prompt and illuminating upload of the different period cross ram intakes. I wasn't sure if the material below the water inlet neck curved inward towards the base of the intake, whereas the photo provided clearly confirms that the shape is solid to the base of the casting. I had fairly good material to go by - but clearly not the best! The subtle curves noticed as part of the shape of the plenum cover weren't readily discerned either from my material, and hence something else to include. The finished item will thus be far richer in detail for your contributions. My thanks again. I'm thinking at this point that aluminum or brass tube filled with two-part epoxy will be the way to go with regards to axle tubes and spindles, for very fearful I am of making things too 'light duty' and hence needlessly delicate. Brass wire or perhaps piano wire will be fed through the epoxy, and hence all combined elements should be stiff enough not to break apart for repeated handlings. I will more carefully examine the rad. support shape relation to the hood opening and such. It does seem a bit exaggerated, and hence in need of subtle reshaping. I'm very glad those manifold photos were beneficial to you and your project. That's part of what this is all about. Let me know if you need photos of some other specific things that may be helpful to your efforts. I'm not guaranteeing I will have them but you never know, I just might. If I don't, maybe a appropriate photo can be sourced from another visitor to this forum. That is a good idea regarding using metal pieces for parts of the rear axle assembly. As for the radiator core support, there should be a gentle arching of the metal along the upper/middle part of the piece and the edge that is folded over toward the front should also be arched to mimic that. Generally, I think the top/forward part of the core support is too thick but check it out for yourself against pictures of an original piece and judge for yourself. Sometimes a photo is not the same as looking at something in person. I do appreciate hearing about how you cast pieces to have as extras and to use for trial and error. It sure is more complicated than any model I ever worked on, but it is fascinating. Mostly wrapped up in school and stressing about post-grad. educational options, whereas a certain spare 1:18 Lane '68 Pontiac 400 Ram Air II engine and a half-finished wheel/tire conversion dating from three years ago proved too much a temptation across recent weeks. Yes, nice homologation specials are collected and converted too. The full-on racers become all-consuming and shut other life out, hence a limited thing whilst facing school challenges. Thanks Jon for adding so many nice T-G articles in recent times - they are very much appreciated as is all else you do and all that others contribute. Wheels and tires: Hwy 61 Goodyear Polyglas GT in the F60-15 size mated to modified GMP Rally II wheels. The GMP wheels have been trimmed of their outer trim ring, whereas the stock issue outer rims/lips from the ancient 1:18th ERTL '70 1/2 Pontiac Firebird Trans Am issue were cut free from the standard and uninspired Rally II's and reused here. Tamiya Mica Silver seems the closest match, whereas the wheel center caps were washed out with paint thinner before Tamiya transluscent red was applied/pooled to finish matters. If nothing else, here we have very nice '70 1/2 footwear and accidental accuracy given that the first year second generation Trans Ams did indeed make use of a 14 center wheel stamping with the welded-on rim stampings proper making up the dimensions to afford the buyer a 15 inch wheel. Like most diecast model car wheels, they are pretty much zero offset and hence mated up to the standard wheel backs without huge difficulty. Front ride height reduced a bit, whereas that strange tendency to have the rear axle of these Firebirds oriented too far forward relative to the driver's side wheelhousing has here been corrected. Track just a touch wide, and will be taken in a bit prior to final assembly. Shell: Grille surrounds painted silver - masked grille mesh proper with an inset panel and simply taped off top borders to preserve chrome plate. SD-455 specific underhood braces cut clear off - not hard and touched in with care. Front filler panel and cowl area painted semigloss black - Tamiya tape employed as well as a Silly Putty mask around the cowl area - great stuff it is to mask difficult areas in-situ. Strange extension of rubber seal seen on base of forward edge of C-pillar filed back to a contour resembling what is normal, whereas all cast-in rubber trim painted black in anticipation of applying foil. I hate applying foil, suffer nightmares from past experiences, and yet it is so needed here. Oversized TRANS AM markings deemed correct for '73 and later, will likely be replaced with early Monogram kit release of '70 1/2 Trans Am. 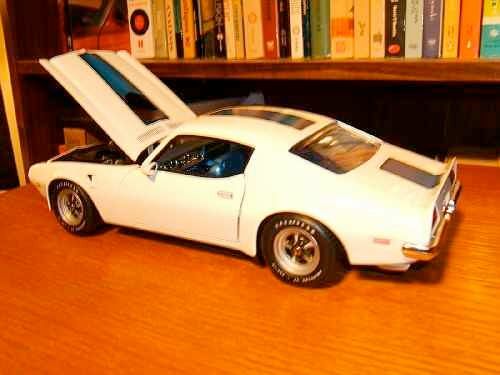 Later releases not licensed as Trans Ams, hence only Firebirds sans T/A markings - go figure. 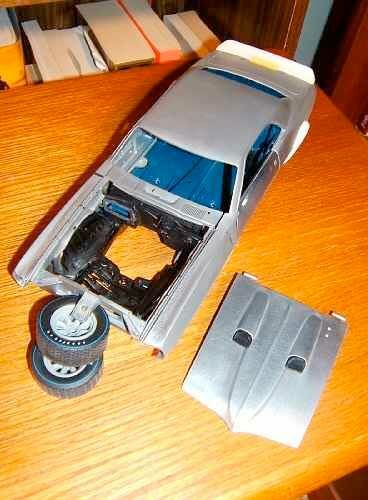 Chassis: Really quite unenthralling but for paint. 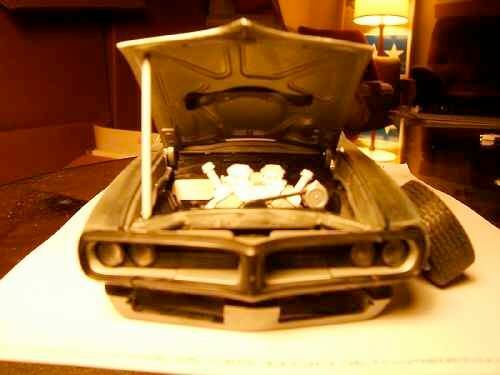 Spare 1:18 Lane Pontiac Ram Air II '68 Firebird powerplant installed here, mysteriously transformed into a fair '70 Ram Air III - proof that expensive spares in my care eventually find life beyond the grave. Less than amazing Lane carburetor replaced with a quite fair 1:18th Hwy. 61 '69 Chevrolet Camaro (350 powered) GM Quadrajet. Welly shaker with seal substituted, filter housing/base with two snorkels to come. Have to cast spare snorkel and not at all looking forward to it. Water pump and accessory drives refinished in Pontiac Aqua or semigloss black for the assemblies come through from Lane painted silver. Fan shroud cut to remove overflow/sealed coolant system tank ala later Firebirds/SD-455, etc. Master cylinder from 1:18th ERTL '70 1/2 Camaro Z/28 soon to be added, anticipate doing little more short of adding a battery - likely from a 1:18th Ertl Authentics '67 Impala SS with proper clamps. Exhaust outlets sanded and reshaped, whereas centers drilled out and flat black paint applied inside. ...fuzzy and not ideal, but nevertheless fairly good. ...as if there were any doubt as to what the project is. This 1:1 example seems to wear black PMD center wheel caps, but early press examples did wear the '69 and earlier caps, so no foul declared. You are incredible. The level of detail is astounding, I would be very happy with a model half as good as you intend, but that is more a reflection of my standards I guess. The 70 1/2 Titus cars were sometimes ugly, sometimes very good looking, but they deserve their place in the history of the series. I have an Ertle 1/18 that has been begging for the Titus treatment for a very long time. I can't wait to see your progress, but please keep the momentum going on the 68 ized 69 T/G car. The car is just stunning, even if you say it is not completely done. Yes, the rear track could probably stand to come in a wee bit but I see very few nits to pick. Really nice work! Thanks for sharing that with us.